Blinkbox introduces UltraViolet digital TV and film "locker service" | What Hi-Fi? Blinkbox introduces UltraViolet digital TV and film "locker service"
If you're a Blinkbox subscriber and would rather not have to purchase separate digital and physical versions of a TV programme or movie, the introduction of UltraViolet to the service might come as a welcome announcement. A consortium of over 70 companies – such as Warner Bros Home Entertainment, 20th Century Fox Home Entertainment, NBCUniversal and Sony Pictures Home Entertainment – have given backing to the UltraViolet service. 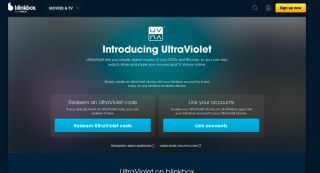 Billed as a "digital movie and TV locker service", UltraViolet lets you build a digital collection from a number of physical discs bought in-store, making them available to stream or download on a range of compatible devices. If the disc that you've bought from Tesco or any other participating retailer comes with the UltraViolet logo, that means you can access that TV programme or film via Blinkbox after you register and enter the redemption code included. And the designated titles that you "buy to keep" from Blinkbox will qualify for UltraViolet rights, which means that you can stream, download and share with up to five family members. Blinkbox Movies and TV managing director Adrian Letts said: “We are delighted to offer customers even more ways to enjoy the latest movies and TV shows on their terms, whether they’ve been purchased in-store or online." Tesco's Ian Ditcham added: "This is about helping movie and TV fans on their journey from physical to digital entertainment, while also offering flexibility in how movies and TV shows can be easily shared with family." Among the titles available to stream or download with UltraViolet are The Amazing Spiderman 2; Bad Neighbours; Rio 2; and 300: Rise of an Empire. The announcement comes just a couple of weeks after media reports surfaced with the suggestion that Tesco was looking to sell or shut down Blinkbox, with the supermarket giant considering a move away from "non-core businesses".